Deborah Smith Pollard sings along to “Oh Happy Day” during her lecture. 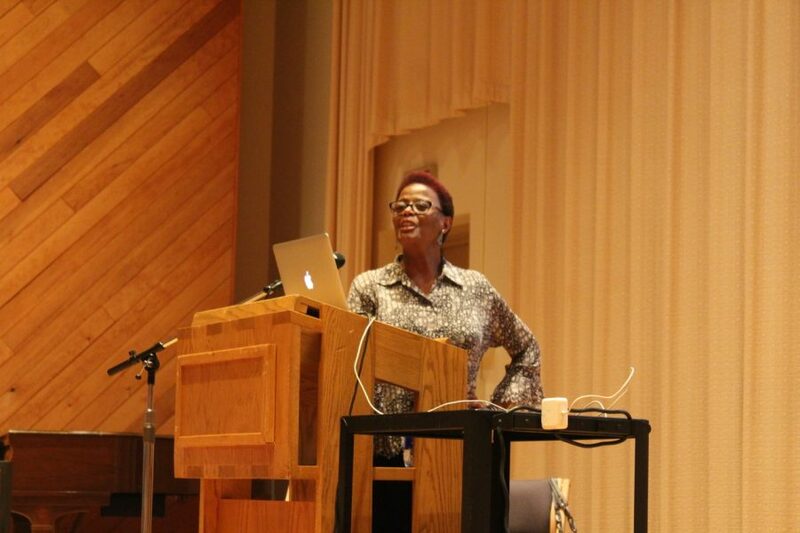 Dr. Deborah Smith Pollard gave the 2019 Sihler Memorial Lecture entitled “When I Get to Heaven, I’m Gonna Jump and Shout: Female Artists and the Life-Changing Song ‘Oh Happy Day’” on March 19. This lecture was a part of Luther’s celebration of Women’s History Month and the 50th anniversary of the Black Student Union. The Sihler Memorial Lecture was established in 1980 to give lecture funds focusing on women in the church and in church music. Pollard is a professor of English Literature and Humanities at the University of Michigan-Dearborn. She has also been a prominent voice on Detroit radio for over 30 years and was named “Gospel Announcer of the Year” in 2006 at the Stellar Awards. Pollard has lectured all over the U.S. and internationally. Pollard focused her lecture on the gospel song “Oh Happy Day,” describing how it was created, how that creation was influenced by women, and how it influenced more women to get involved in gospel music. She told stories of several women involved with the making of the song, and then expanded to include women who were influenced by the song and went on to have influential careers in gospel and other musical genres. The first story she told was about the choir director and arranger Edwin Hawkins who arranged the song and formed The Edwin Hawkins Singers, the group that sang the song. The lead vocalist for the song was Dorothy Combs Morrison. According to Pollard, Morrison left the group when Hawkins would not give her individual recognition for her performance. Despite the split with Morrison, the song was incredibly successful, selling over 7 million records. A number of artists made their own renditions of the song, and one important remake was the folk version produced by Joan Baez. Bethany Larson (‘19) enjoyed that Pollard recognized the impact the song has had on culture and demonstrated the range of that influence for the audience. During the lecture, Pollard also told the stories of several people who were influenced by the song, including owner of Gospo Centric Records Vicki Mack Lataillade, gospel legend Dorothy Norwood who performed the song on tour with the Rolling Stones, and international evangelist Gwendolyn Reid who formed five gospel choirs based around the performance of the song in Japan. Attendee John Bendt (‘20) thought that Reid’s story was inspirational and encapsulated an important take away from the lecture.